from my bookshelf: 46. X-Men: Divided We Stand by Mike Carey, et al. 46. X-Men: Divided We Stand by Mike Carey, et al. In the wake of Messiah CompleX, there are no X-Men. But where does that leave the mutants that were X-Men? Some of the industry's hottest creators bring you stories of your favorite mutants as they make their way in a world without the X-Men. And only those who adapt will survive. 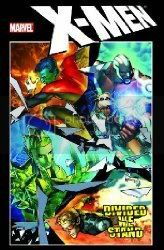 Featuring Cannonball, Husk, Nightcrawler, Storm, Black Panther, Neznho, Anole, Beast, Dark Beast, Havok, Vulcan, and Surge! Plus: Guest-starring Cyclops, Wolverine, Colossus and the rest of Marvel's mightiest mutants! This spectacular will usher in a new era for the X-Men! The future of mutantkind starts here! Just a collection of short stories that don't seem to have any real bearing on the overall story being told. These stories follow up on some of the lesser characters in the X-Titles right now, I guess telling why we won't be seeing most of them in the upcoming collections. If you're following the current X-Men stories and skip this collection, I don't think that you'll be missing a thing. 53. X-Men: Manifest Destiny by Mike Carey, et al. 43. X-Men: Messiah CompleX by Ed Brubaker, et al.